Facebook is a hotbed of posters, homilies and words of “wisdom”. Some are funny, some tug at heart strings, while others are meant to make you stop and contemplate. They tend to get recycled over and over – the more successful it is in its intent, the more often you’ll see it come around. The subject of horses gets more than its fair share of these posts – they are, after all, a topic that strikes emotional strings (of one sort or another) for all who are involved with them. There is one poster making the rounds that gets a lot of likes and shares – but not from me. I understand the gut reaction to it – I too had an initial positive reaction, followed immediately by a sense that something was wrong. It’s worded carefully to get an emotional reaction. So, I read it more carefully and my distaste grew – I realized there is deeper meaning in the words that gives it a less than horse-friendly slant. I admit it’s a bit of a game of semantics – but words matter. They can shape our views in ways we’re not always aware of. To begin with, here is the poster. There are a few key words in there meant to elicit very specific emotional responses, most notably: “kill you”, “trust” and “true horsemanship”. None of us want the first (and many fear it with such large animals) and we all strive for the latter two. So, what’s not to like? Let me break it down into each of its parts and explain why it gives me a viscerally aversive reaction. : the process by which an athlete prepares for competition by exercising, practicing, etc. What part of this is not something that applies to horses? They are arguably athletes that we prepare for competition. Is the fact that they are a flight animal somehow a reason why they can’t learn skills? This phrase promotes the outdated idea that the horse is somehow an animal that only “reacts” and does not have any capacity to think or to learn through anything other than pure reaction. This phrase furthers the antiquated notion of a purely reactional animal, and further promotes the “cowboy” notion of “us against them”. Your horse is somehow out to get you, or is so out of control of his own actions that he’s likely to kill you as collateral damage in one of his panic attacks. Yes, it is certainly true that an animal that large can do serious damage, even without meaning to – but this phrase gives the horse assassin status. This notion that your horse could kill you at any moment is also a pet point for many Natural Horsemanship “gurus”. They all have their pet phrases for us owners who are so taken in by our dangerous horses that we are subject to death at any moment. One of my favorites is Clinton Anderson and his “tree huggers”. The fact that I do not live under the cloud of impending doom when I’m around my horses, while still doling out carrots and hugs, does not make me somehow a born victim (not to mention the fact that I love trees and resent the implication that this somehow deserves condescension). Yes, your horse’s trust is exactly what you want – but can you “prove” to someone that they can trust you? You can earn trust – but you do that by acting in a trustworthy manner, and it becomes the individual’s choice to trust you or not. The word “prove” probably would not bother me in a context where an adversarial relationship wasn’t already implied. How do I “prove” to an animal that is about to kill me that he can trust me? If he can kill me in the blink of an eye, why would he possibly need me? And, in a relationship, isn’t trust a mutual condition? Why would he possibly trust me if I can’t trust him? And how do I trust something that is about to kill me? This is where I really put the stops on. First, his instincts are there for a reason – that reason is survival. We, too, are born with instincts. Have you ever had a sense that you should or shouldn’t do something, but you ignore it … and end up regretting it? I, for one, have had an “instinct” about something not being right. Since I am human, I am likely to override that “sense” or “instinct” with reason – and most times have regretted not listening to my “gut”. Why would I want to teach my horse to completely yield all of his instincts and sense to me? I have personally experienced situations where my horse’s instinct saved my hide. On the other hand, as humans we learn that we can’t always yield to our instinct. An toddler’s instinct is to grab anything that looks like food and eat it. Over time we teach them that is not allowed – at least, it is impolite in society; at worst, it is dangerous. So, over time, your toddler learns to ask for things and to discern those things that are safe to eat and those that aren’t. This brings us back to that first part of this poster, that reduces the horse to a flight animal with no control. Horses, like toddlers, can learn to control their instincts. Over time they can learn that an umbrella won’t eat them, so flight is not needed – but retain the instinct. It may come in handy when that neighbor’s dog comes around in a less than friendly manner. In the case of my horse Ben, it nearly meant the end of a couple of ill-mannered dogs – and I was more than happy to let his instinct take care of that situation. Both dog and horse can move faster than I can! This is the final kicker to this poster. Who doesn’t want “true horsemanship”? But true horsemanship cannot be reduced to a few lines on a poster. True horsemanship is a highly complex thing, involving all aspects of horse handling and care. 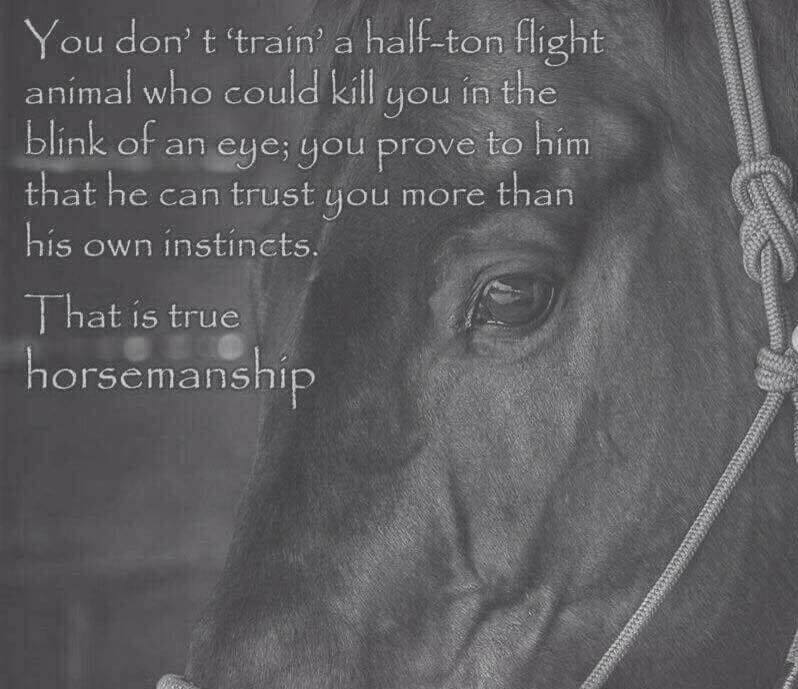 It is a commitment you make to your horse, to be worthy of the trust you want him to give to you. It takes time, learning, care … and a bit of your own instinct. It is not a simple thing with specific measures of success – you have to be able to read your success in the physical and mental state of your horse. If you love your horse, and try always to do what’s right by him, then you probably wouldn’t have read this poster and suddenly seen him differently. But there are a lot of people still trying to find their way around horses, and a poster like this can set the wrong path for them. So, the next time you see one of these posters on Facebook, take a moment to really read it before you like or share. Is it truly meaningful? Or did they just use some key words that “ping” the emotional centers of your brain? What message is it sending about these beautiful souls that we love? This entry was posted in Thinking Out Loud and tagged dangerous, emotions, Facebook, flight animal, horsemanship, horses, poster, relationship, training, trust. Bookmark the permalink. The “prove” trust bit makes me think of con artists. On TV when con men want to gain someone’s trust they often set up a bad situation that they can appear to rescue the “mark” from it. I’m pretty sure there are parallels in the horse world. I’m all for rescuing a horse who gets himself in trouble, but don’t put one in a bad situation just so you can “prove” he should trust you. Very insightful and excellent parallel! And sadly, yes, there are practices like that in the horse world. The other one it makes me think of is the “sink or swim” method – throw the kid in the deep end and if they don’t drown you say “see, nothing to worry about … I wouldn’t let anything happen to you!” Never mind the panic and possibility of drowning! And there are parallels to that in the horse world, too.